According to The Wrap, Emma Thompson and Kevin Kline are the latest illustrious thespians who have been added to the ever-growing cast list for Disney’s live-action musical remake of Beauty And The Beast, which so far includes Emma Watson as Belle, Dan Stevens as the Beast, Luke Evans as Gaston, and Josh Gad as LeFou. 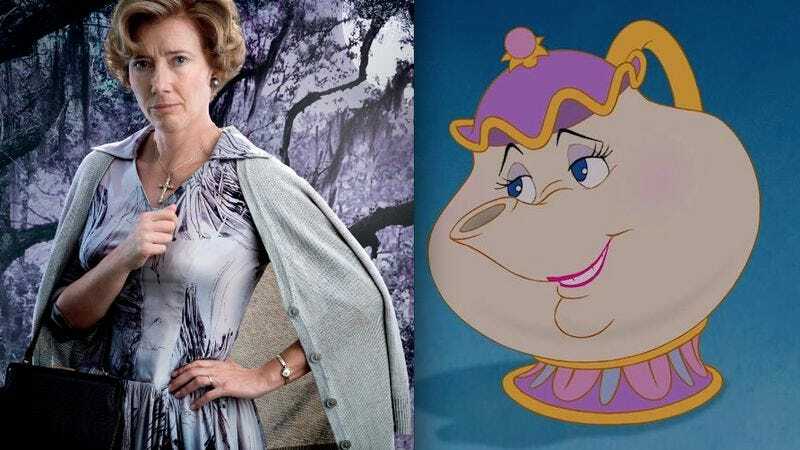 Having previously terrorized Watson as the incompetent Professor Trelawney in the Harry Potter series, Thompson will now serve as her far gentler mentor, Mrs. Potts. The maternal talking teapot—who was voiced by Angela Lansbury in the animated film—sings the signature number “Beauty And The Beast.” Thankfully, Thompson is no stranger to musicals, having starred in a concert version of Sweeney Todd just last year. And while the Tony-winning Kline would seem like a perfect fit for the ostentatious candelabra Lumiere, he’s actually playing Belle’s bumbling, inventor father Maurice. The role is a non-singing one in the movie, but the stage musical added a (rather boring) duet between Maurice and Belle. Alan Menken and Tim Rice are reportedly writing additional songs for the film, so Kline could potentially get some new material as well. Thompson will probably just be lending her voice to a CGI teapot, unless the film asks her to complete some Andy Serkis-esque motion capture. Either way, she’ll likely pop up onscreen at some point as the human housekeeper underneath the cursed teapot. The animated film definitely implies Maurice has a thing for the human Mrs. Potts, so get ready for some hot Kline/Thompson chemistry when the film hits theaters March 17, 2017.